Sports fans, athletic directors and administrators have relied on the style, performance and innovation of Fair-Play Scoreboards to stay on top of their game for more than 70 years. Fair-Play Scoreboards, a Trans-Lux company, designs and manufactures quality scoreboards and accessories for high schools, colleges and municipalities. The company is an industry leader in LED scoreboard technology and wireless sign controls. The Scott "North Star" fountain aerator is a proven solution for keeping your water sparkling clean while simultaneously providing beauty and healthy aeration. This unit is a proven workhorse, effortlessly moving up to 600 gallons of water per minute. The vibrant, trumpet-shaped spray moves water 12 feet high and 18 feet wide, creating a functional yet visually appealing display. Rugged stainless steel design makes it ideal for saltwater, too. Oil-free submersible motor is environmentally friendly. This customized pavilion was ordered from GazeboCreations.com for hosting picnics, parties and get-togethers. This state-of-the-art Web site offers nine completely different styles, with a multitude of options and preferences to make your pavilion both one-of-a-kind and utterly suited to your specific needs. With low freight rates, GazeboCreations.com is a perfect place to find a completely personalized structure. Offering pergolas, gazebos, bridges and other structures for commercial use. Bradley Corp. introduced its new and elegantly refined VergeTM Lavatory System for high-end commercial restroom applications. Characterized by its sleek and modern design, as well as its durability and low-maintenance features, the Verge Lavatory System incorporates a beautifully sculpted elongated basin with a hidden drain, conveying upscale sophistication. Made with Bradley's new EveroTM Natural Quartz Material, a resilient natural composite material, the Verge stands up well to high traffic and everyday usage. Easily accessible and ADA compliant, the Verge can be ordered in 60-inch (two station) and 90-inch (three station) lengths and is available in 14 soothing colors inspired by nature. EZFacility's scheduling and management software enables the effortless scheduling and management of trainers, instructors, classes, fields, courts, rinks, lessons, referees, rooms, equipment and more, all from one easy-to-use Web-based interface. With a few simple clicks, staff members can locate available times, book trainers and instructors, create reservations, and generate invoices and track payment status. Fitness memberships can also be created, managed and billed automatically or on a recurring basis. In addition, multi-sport facilities can manage all aspects of scheduling leagues and tournaments, as well as posting all scores, standings and schedules directly to their existing Web site. GymValet® is a perfect holder for sanitizing spray bottles and towels. It attaches directly to all strength training and cardio equipment. With the GymValet, equipment sanitizing supplies are precisely where they need to be—right at every exerciser's fingertips. GymValet provides safety—when equipment surfaces are cleaned after each use, the chance of user-to-user germ and virus transmission is minimized. It also saves money—the GymValet Equipment Cleaning System saves money versus paper towel and pre-moistened wipes-based systems. It protects the environment, eliminating the waste from paper towels and wipes. And it is easy to install and easier to use. 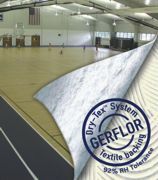 Gerflor's Taraflex Dry-Tex System saves time and money during installation on high-moisture slabs by resisting up to 12 pounds of moisture or 92 percent relative humidity. The system is a non-woven material integrated into the dual density backing of Gerflor's Taraflex sports flooring and provides a more cost-efficient moisture protection than competing slip sheet or third party solutions. Paired with Gerflor's Gerpur adhesive, Dry-Tex helps architects, contractors and installers deliver projects on time with proven results. Dry-Tex is the ultimate line of defense against last-minute moisture issues that can arise during installation. Utilizing modern Roman design styles, the Coverworx design team has created the original Crescent Curve Design Roof prefabricated shelter. Available in 16-by-16 feet, 20-by-24 feet and 24-by-30 feet standard sizes, this Coverworx original design features a Curved Standing Seam classic curved roofline, Neoclassic style banded four-leg support columns and polyester powder-coated steel framework. Installation always available.